If you signed up for the Unlimited or Business plan on Squarespace, you can publish a gallery and page to your Facebook page. If you don’t have a Facebook page, you can sign up for one at Facebook Pages. Linked Facebook Page: Select the Facebook page to which you want to publish your Squarespace gallery or page. When your gallery or page is published to your Facebook page, it will be added as a feature called a tab. Tabs appear below the cover photo of your Facebook page. Squarespace Gallery Tab: Click the Install Tab button to select the gallery page from your site in the drop-down menu to publish to your Facebook page. Add a gallery title to be displayed on the Facebook page. 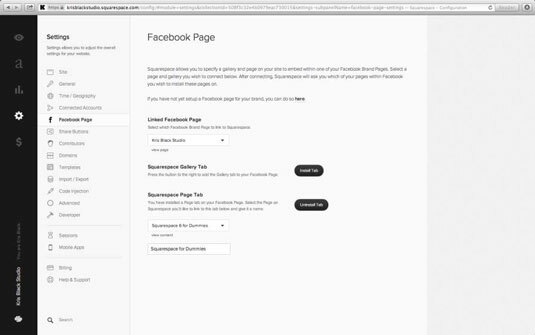 Squarespace Page Tab: Select the page from your site in the drop-down menu to publish it to your Facebook page. Add a page title to be displayed on the Facebook page.